Student loan debt can cost you more than principal and interest. It can mean postponing major milestones of adulthood. A survey by Bankrate.com released Wednesday found that 56 percent of people aged 18 to 29 have put off major life events like getting married, purchasing a car or home, or saving for retirement, because of student debt. Older people were not immune to the ills of student debt either. Forty-five percent of those 30 and older said educational loans hampered their financial life, according to the survey of 1,000 people in July. 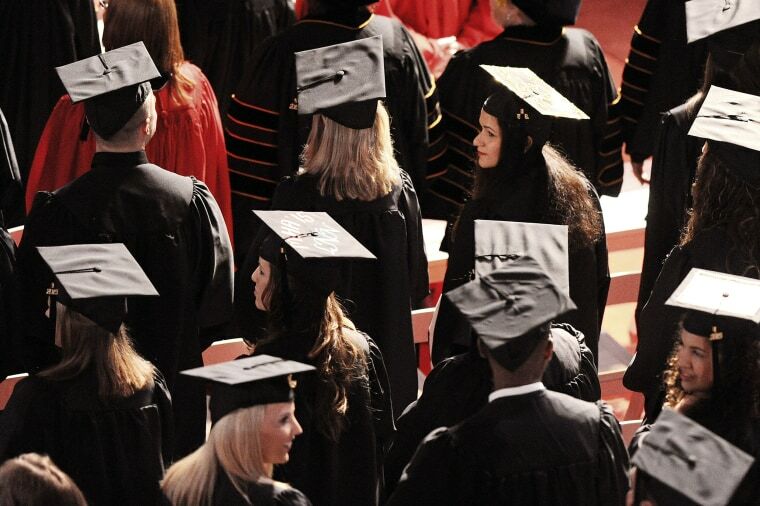 "Student debt is a drag on the economy," said Steve Pounds, a Bankrate financial analyst. "If people aren't buying homes, aren't buying cars and aren't saving for retirement, it's going to have a detrimental effect." Despite the high levels of student debt, Americans are becoming more optimistic about the value of a college education, according to a separate survey. Fifty-two percent of respondents said a college education is a good financial investment, according to Country Financial Group's latest financial security index, up from 48 percent in 2014. It's the first time in seven years that the percentage of people who thought a college education was a good investment has increased. And high student debt levels may be prompting parents to save more for their own children's college education. One-third of parents still have student debt of their own, according to a recent survey by the College Savings Foundation, but 51 percent of parents said saving is their top strategy for funding their children's college costs. That's up from 45 percent in last year's survey. Of the 800 parents surveyed by the foundation, one-third had a 529 college savings plan, which gives users a tax-advantaged way to invest and pay for college costs. Yet millennials face the biggest hurdles to reach the same financial turning points previous generations reached in their younger years because of student debt. Credit bureau Experian finds that millennials have the lowest credit scores of any generation – an average of 625 compared to 650 for members of Gen X and a national average of 667. They also carry as much nonmortgage debt as Gen Xers, but have lower income on average. Better budgeting can help any generation manage their debt and reach their goals, financial planners say. Paying off student loans shouldn't be the sole financial focus of millennials, said Tom White, founder and CEO of iQuantifi, an online financial planner. "Millennials can pay down their debt, save for a home and retirement at the same time. It's about looking at their financial situation holistically," he said. Even small amounts invested in retirement plans by people in their 20s can produce big results thanks to the power of compounding, said John Bucsek, a certified financial planner and managing partner of MetLife Solutions Group. He recommends millennials contribute to employer-sponsored retirement plans at least up to the employer match. Millennials can also save for retirement and for a home by investing in a Roth IRA, which allows first-time homeowners to withdraw $10,000 plus their original Roth contributions to buy a home (within a restricted time period), Bucsek said. Student loan debt is a drag, but it doesn't have to be an anchor. Tom Anderson is a personal finance writer for CNBC.com.